Up against 137 teams nationwide, four MUM MBA students place first in the CAPSIM business simulation. 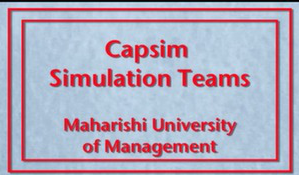 A favorite course activity among accounting students is the CAPSIM Foundation Simulation, an online business simulation that challenges students to work in teams of 4-5 people while making a series of decisions running a fictional company. Four years in a row MUM had one or more MBA accounting teams that placed in the Top 10, competing against some of the best business schools in North America and around the world. Our students’ success in the CAPSIM Foundation Simulation validates the quality of our students’ skills in integrated decision-making and shows the readiness of our MBAs to compete successfully in the marketplace. This is especially notable with respect to the high percentage of international students with diverse cultural backgrounds in our MBA programs at MUM.